A debate held on the Saturday before Christmas seemed almost designed to repel, not attract, viewers. And sure enough, ABC's Democratic debate in New Hampshire drew a far smaller audience than CNN's Republican debate in Nevada earlier this week, according to very early Nielsen ratings data. But the ratings are about in line with the Democratic debate that CBS televised, also on a Saturday night, last month. The CBS debate averaged a 6.1 household rating in Nielsen's "metered markets," metropolitan areas where early ratings comes from. The ABC debate averaged a 6.0 household rating. More complete viewership totals for Saturday night will be available on Monday. ABC executives had relatively low expectations for the ratings, owing to the Saturday night timing and the holiday season. But the network did handily beat its broadcast competitors, according to the preliminary data. 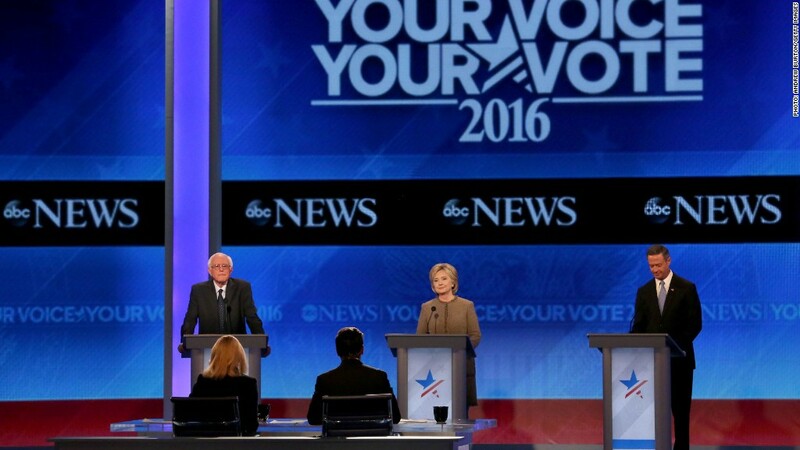 The CBS Democratic debate on November 14 averaged 8.5 million viewers. The only other Democratic debate of the primary cycle was televised by CNN on October 13, a Tuesday night. It averaged 15.3 million viewers. About 18 million people tuned in for the Republican debate on CNN on Tuesday. This year, the debates on cable news channels have out-rated debates on broadcast networks.